Moonee Valley cricketers were given the chance to renew acquaintances with an old friend of our Club when Test aspirant Fawad Ahmed was guest speaker at the Mid Year Cricket Association awards night on September 2. Fawad played a couple of Twenty20 games for Moonee Valley in 2010, and was seen regularly around our Club when Ihtisham Uddin and Murtaza Khaliq were pullling on the Valley whites. He's progressed significantly since then, with Sheffield Shield titles for Victoria under his belt, a number of seasons in the Big Bash league and Test tours of England and the West Indies. Fawad gave an entertaining presentation at the Winter Comp awards night, touching on his determination to establish himself as a top-grade cricketer after fleeing hard-line persecution in Pakistan as a result of his sport. 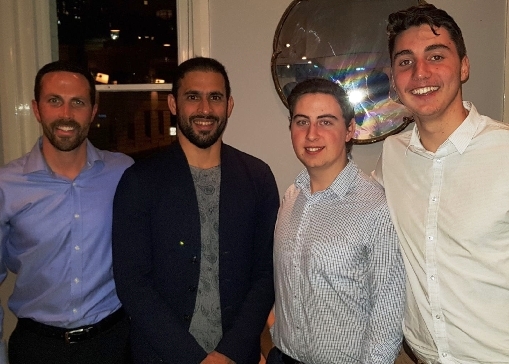 At the end of the presentation, Moonee Valley's Michael Ozbun, Matthew Esmore and Stephen Esmore took the chance to catch up with Fawad for a chat and a photo opportunity. Above right: They've all proudly pulled on the whites for Moonee Valley - Test aspirant Fawad Ahmed (second from left) with L-R Michael Ozbun, Matthew Esmore and Stephen Esmore. 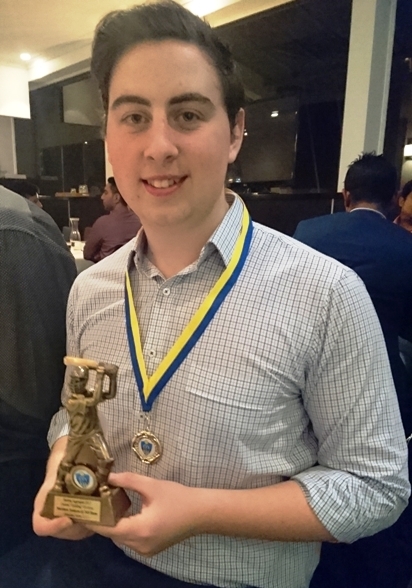 Matt Esmore took all before him in the winter comp, winning the Central Division Fielding Shield batting award with 345 runs at a staggering average of 86.25 - an average 30 runs better than the next-placed batsman.Matt was Mr Consistency throughout the season, scoring five centuries, a 40 and a 39 not out. At left: A stellar season - Matt Esmore with his batting award for the MYCA Central Division and his MVP medallion - the John Hammer Award. He also took more wickets than anyone else in the Moonee Valley Black team, with 11 at a healthy average in the pre-finals games of 22.91. The Moonee Valley Black team under skipper Michael Ozbun finished on top of the ladder, but faltered in the semi final. The Moonee Valley White team, captained by Shane McDonald, had a tougher season in the Inner North West Division, winning three games and finishing seventh on the ladder. The 2017 season was Moonee Valley's fifth in the growing winter comp and second with two teams, and we're strongly committed to this standard of cricket in the off-season. We play our home games out of Fairbairn Park in Ascot Vale, which is the home of winter cricket in the north-west. Moonee Valley Cricket Club is back at Ormond Park from Tuesday, September 12, as we plan for a big 2017/18 season. The seniors have already done a solid indoor pre-season block, while the juniors are also on the park from the week of September 10. We've confirmed key appointments in Lou Raffaele as coach, Mark Gauci as First Eleven captain and Darren Chant as Second Eleven skipper, and are set to confirm and announce captains of our other grades in the next couple of weeks. 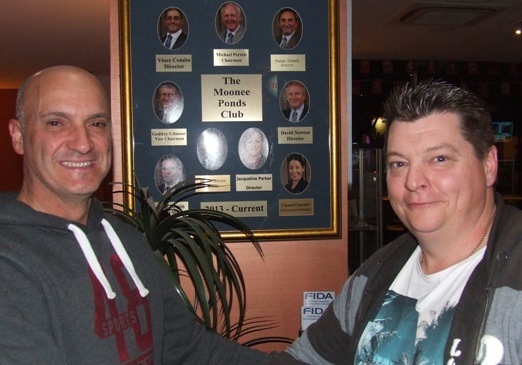 At left: Coach Lou Raffaele (far left) congratulates Mark Gauci on his appointment as First Eleven captain - which was confirmed after an interview at the Moonee Ponds Club. We have welcomed the return of Club Champion Chanaka Silva from Sri Lanka for his third season at Moonee Valley, and have two young English guns - James Wolfenden and Sean Duckworth due to arrive later in September for their "year in the Colonies". James and Sean have been in regulr contact with Moonee Valley VP Simon Thornton, and are much reassured by his description of his conversion from a Yorkshireman to a Fair Dinkum Aussie over the past eight years. We still have spots available in our six senior teams - and quite likely a seventh team this season as well. Anyone interested in joining our successful and progressive club can phone coach Lou Raffaele on 0450 181 948, Mark Gauci on 0457 778 335 or Club President Charlie Walker on 0411 705 381. Moonee Valley's 2016/17 is now out, and it comprises 112 pages of great reading, stats, photos and facts. Wisden has been a labor of love since it was first produced annually by our club in 1983/84, and it details every player to have pulled on the whites for Moonee Valley, and all their stats. You can click on the link to the online version HERE. Junior Wisden, which details the same for our youngsters, is also in production, although it's a couple of seasons behind. So what are the secrets of our 2016/17 Wisden? *Who's captain of our Wisden Team of the Year? *Who grabbed third spot on our all-time list of most runs in a season? *Who's the first Moonee Valley player to take a double hat-trick? *Who are the opening batting pair in our Wisden Team of the Year? *Who are the five players voted by our experts as the Wisden Players of the Year? *Who's the odd man out - a Wisden Player of the Year, but not selected in the 12 for Team of the Year? *Which new record partnerships were set in 2016/17? *How many players pulled on the whites for our winter comp teams in 2016? *Who were our stars in the Barooga Over 35s tournament in January? *How many centuries were scored by Moonee Valley batsmen in 2016/17? *Who's won the most batting, bowling and fielding awards over the years? These are the sorts of questions that our players regularly ask around the clubrooms during the season, and to while away the hours over winter while we wait for the 2017/18 cricket season to roll around. So sit back, and flip through the pages of Wisden. The answers are all there. Last updated: September 4, 2017.